A utility pass template that simply runs another pass multiple times. This can be useful when debugging or testing passes. 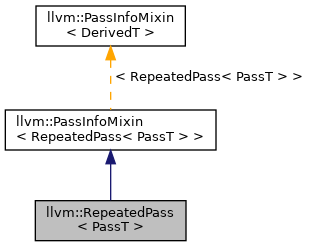 It also serves as an example of how to extend the pass manager in ways beyond composition. Definition at line 1402 of file PassManager.h. Definition at line 1404 of file PassManager.h. Definition at line 1407 of file PassManager.h. References llvm::PreservedAnalyses::all(), llvm::AMDGPU::HSAMD::Kernel::Key::Args, IR, P, llvm::PassInstrumentation::runAfterPass(), and llvm::PassInstrumentation::runBeforePass().